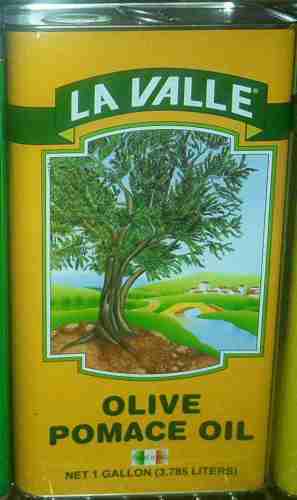 If you can call the very first, softest pressing of olive oil, virgin, then pomace oil must be extra slutty. Olive oil ratings mostly have to do with how much pressure is placed on the olive pulp and seeds and how long it was pressed.Â You load the press up with crushed olives, and start pressing.Â The first oil that comes out of the press with the lighest amount of pressure is called “extra virgin”.Â The olive pulp gets pressed a bit harder and a bit longer and you get regular olive oil.Â Take what’s left over, grind pulp and seeds and process it using various secret methods (chemistry is involved).Â What comes out is “pomace” oil.Â This is the lowest edible grade of olive oil.Â Â After this, comes the oil that burns in shrines throughout the mediteranean. Some people turn up their noses at pomace oil, disrespecting it’s industrial birth.Â Some people will tell you that pomace oil is only fit to be use in a lamp or to lubricate your bicycle chain.Â I disagree. Pomace oil has none of the flavor or aroma of olive oil.Â It burns at a higher temperature.Â It doesn’t have the (at least to me) bitter taste of rapeseed (canola) oil or corn oil which also goes through some major processing. I’ve used it a little mixed in baked goods and pancakes, but mostly I fry with it.Â I mix it with about 1/2 toasted sesame oil when I do panko frys.Â Â While it cut’s the sesame flavor a slight bit, things seem to fry better in the mixture than with toasted sesame oil alone.Â It’s hard to beat for frying fish.Â It’s the perfect media for frying squid. It’s difficult to find pomace oil.Â Look for a store that specializes in Italiano or Greek cuisine or just click on the Amazon link below and make me richer than my wildest dreams. Wow, very interesting fun facts on olive oil… and mmm fried fish! I’ll have to try that sesame oil trick next time I panko!